Get fit INDOORS! 10 of our Favorite Mall Walking Locations in the U.S.! The mall. It's that all-American temple of shopping, where folks come to buy, hang out with friends or snag a pretzel at the Food Court. It's also the second most popular location for walking as exercise. 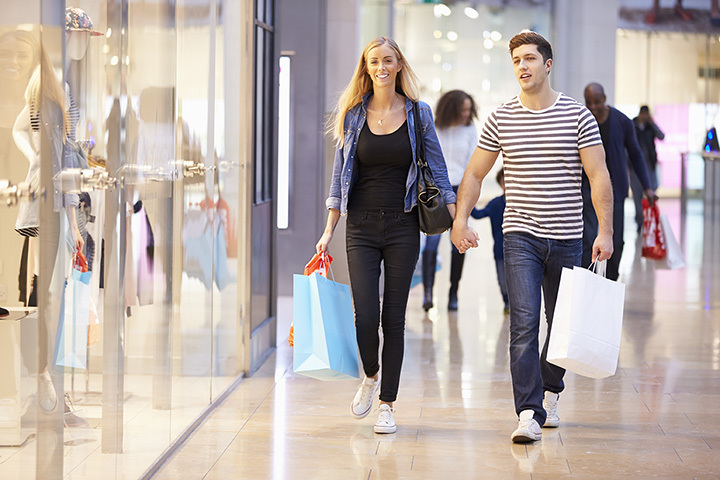 Malls offer a climate-controlled environment, level surfaces, restrooms and security. So it's no wonder that more and more of them open their doors a little early to let folks get their daily workout in before shoppers descend. Most mall walkers are retired, but there are growing numbers of moms and fitness-conscious young people using their local shopping mecca as something of an indoor track. Here are ten malls around the country that will inspire you to dig out those sneakers and head inside! This mall is one of the biggest in the Empire State, and opens at 5 A.M. for early birds to get their stroll on. The measured course runs about a half-mile, and walkers can do some serious window-shopping: the mall features over 250 stores. Walkers hit this mall at 6 A.M. to circumnavigate the third floor route, which tallies at a mile-plus after three rounds. And because the entrance for mall-walkers is by the Food Court, they can reward themselves after with a treat. This Mall Walkers Club is in partnership with Miami Valley Hospital. Registered walkers get a free pedometer, walking journal that shows different routes around the mall and monthly blood pressure checks. It's been the mall-walking destination of choice for years: about 300 people regularly walk the one-mile perimeter. Recently, the Cleveland Clinic joined forces, offering walkers free blood pressure screenings and healthy lifestyle information. Doors open at 8 A.M. for their devoted band of walkers: some have been doing the 1-mile route for years. The mall itself has been undergoing some nice upgrades, which makes the experience even more enjoyable. This behemoth of a shopping center (the largest mall in the country) is also at the forefront of the mall-walking trend. Their walkers even have a name: "Mall Stars." MOA has partnered with the Mayo Clinic to offer not just a walking program, but incentives for reaching goals. Walkers enjoy this mall for its low-impact, carpeted floors, sky views and the natural lighting that floods the space. One full lap equals a half-mile, but most walkers just keep going and going: the window-shopping is endlessly entertaining. Walkers escape the 100-degree desert heat inside this popular mall. A couple of laps around the perimeter equals about 2 miles. Plus, it opens at 5:30 for those who want to get their workout in early. Their walking program, known as Walk for Life, started back in 1987. The mall sound system plays music for Seniors that helps to get their blood pumping (like swing music), and a special kiosk allows walkers to log their distances. Their "Club Ped" takes mall walking to another level. A certified physical trainer warms up walkers with a series of stretches; during the year, "themed" events keep walkers motivated (during the Olympics, there was a fake "torch run").